Yangon a beautiful and vibrant city, and contrary to what many people believe, it is not Myanmar’s capital, however, it is Myanmar’s former capital. Yangon is Myanmar’s largest city, and filled with busy traffic, street markets and enough to see and to eat to last you for days. Wander around the busy streets, go shopping, ride the train or admire some of Yangon’s most beautiful architecture, there is something to do here for everyone’s liking. Yangon is a must see when visiting Myanmar, and differs largely from all the others towns and cities in Myanmar. Not sure what to do or where to go? 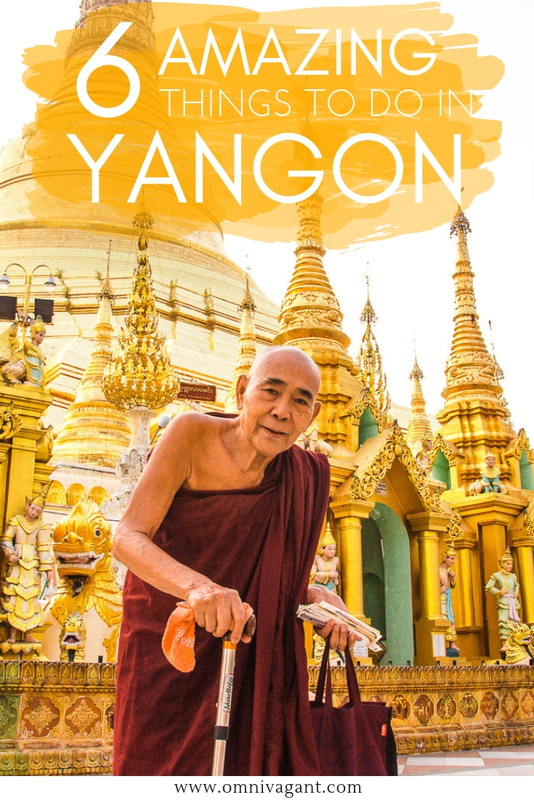 Scroll down below to read more about things to do in Yangon! Yangon, previously named Rangoon, is situated South from famous touristic destinations such as Mandalay, Bagan and Inle Lake. And with the large distance between these destinations, many people opt to skip out on Yangon, which is a shame as there are many beautiful things to do and see in this city. 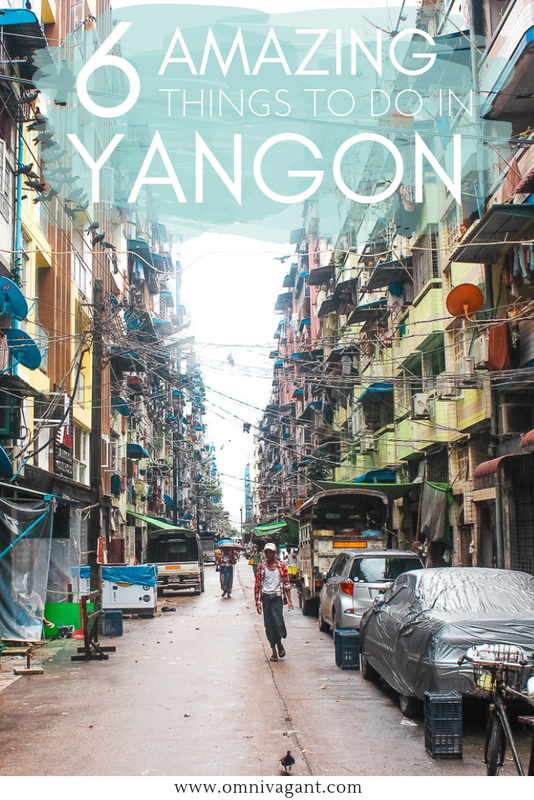 Yangon is Myanmar’s commercial capital, and will be the busiest place you will find in Myanmar, especially if you go to China Town (but more on that later). To give you a better idea of where Yangon is located, check out the map below. Hostel9 Yangon – Hostel9, formerly known as Sleep In Hostel Yangon, is one of the most popular options for backpackers looking to stay in a central location. 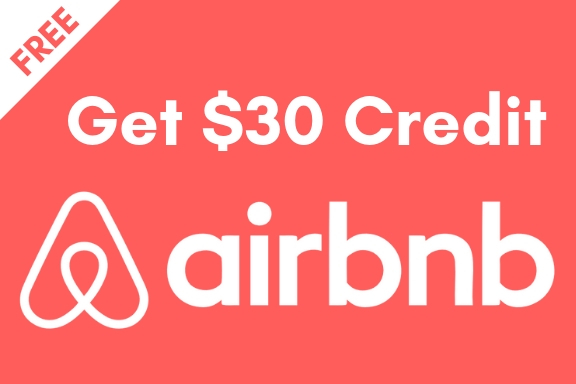 Friendly staff, chill out areas downstairs and a rooftop, and perhaps best of al for the people that enjoy a party, it is within walking distance to 19th street, but more on that below. 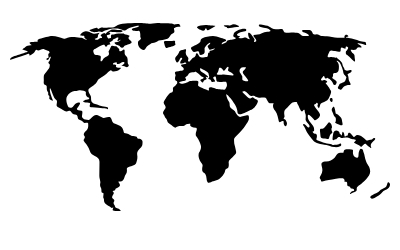 Check out the latest reviews and rates here on Hostelworld! BaobaBed Hostel – BaobaBed Hostel is one of the highest rated hostels in Yangon, offering 24/7 service, a great location in Downtown Yangon, free breakfast included and all day free coffee and tea, what else do you need? While a bit more expensive then most of the hostels in Yangon, this fairly new hostel (September 2017) seems to be worth backpacker’s their money. Check out the latest reviews and rates on BaobaBed Hostel here on Hostelworld! Hotels in Yangon – Prefer not to share your room with 7 other people, or perhaps simply looking for a bit more luxury, don’t worry their are plenty of hotels in Yangon available as well. Downtown Yangon is the place to be for most travelers, so check out the map below to see what will suits you best! The Shwedagon Pagoda, situated on a 99m high hill, in Yangon is a sight you can’t miss. A golden stupa reflecting light night and day, covered with roughly 7000 diamonds truly shines bright. 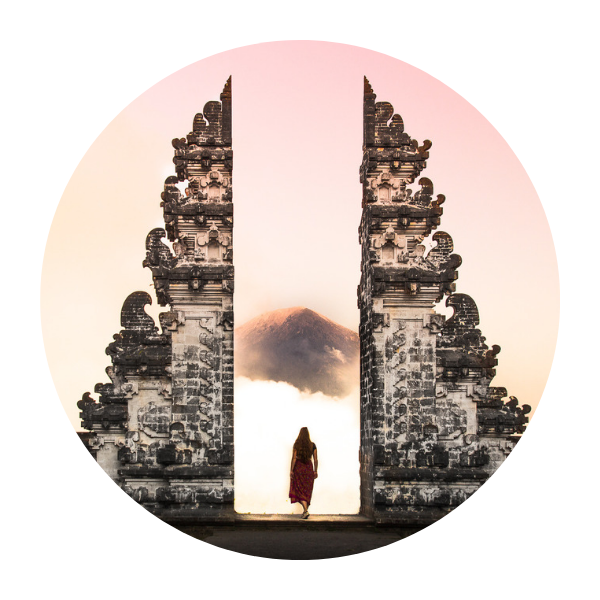 The pagoda is visited by locals and tourists, and having the sight to yourself will be uncommon, but it will still be worth it every second. Admire monks praying and walk around the stupa, you will not be disappointed. With the amount of details The circle train starts running at 6.10 in the morning, and the last full train ride leaves at 17.10 from the train station. There is not much to see in the dark, and taking the train during the day is definitely more recommended.you could spend simply hours here admiring the different angles of the Pagoda. The most magical moments of the day is during sun rise and sun set, as this gives the pagoda a warm golden glow, an experience that should be on your Myanmar Bucket List! Shwedagon Pagoda Dress Code – Don’t forget you are visiting a holy site, you will be asked to take your shoes off and dress modestly which means that you will have to cover up your knees and shoulders. Shwedagon Pagoda Entry Fee – Entry fee to the stupa is 8000 Kyat (roughly 8$) and can be retrieved at any of the entrances. Fun fact: some of the entrances even have escalators going up the hill! Opening Hours for the Shwedagon Pagoda – The pagoda is open daily from 4am to 10pm, meaning that you will be able to catch the sunrise or sunset here, or simply visit during the day. The circle train must be my favorite thing to do in Yangon. A three hour journey going through the neighborhoods of Yangon for roughly 300 Kyat (0.30US$). The train moves slowly past train stations, fields, houses, shops and the local life of people in Yangon. You will share the train with locals, tourists and vendors hopping in and out of the train. Find yourself a nice seat by the window and admire the train passing by. Tickets can be bought at the train station. And you will be able to hop on and off the train, just be aware that it might be a while before your next train stops by (and you will have to by another ticket). While there are so many things to do in Yangon, and often so little time, the circle train is worth the extra day or half day needed! Enjoying the beautiful train rides? 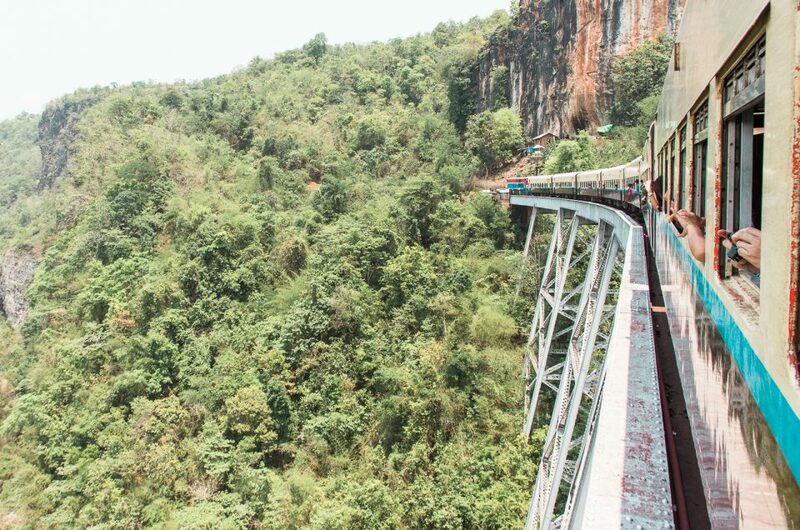 Read about Myanmar’s most scenic train ride here! Best time to ride the circle train – The circle train starts running at 6.10 in the morning, and the last full train ride leaves at 17.10 from the train station. There is not much to see in the dark, and taking the train during the day is definitely more recommended. 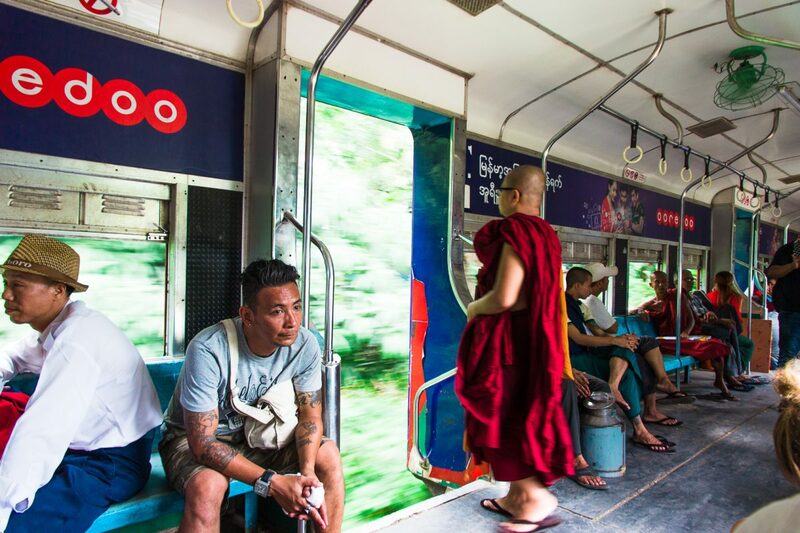 Cost of riding the circle train – A ticket is 300 Kyat, which is valid for one ride on the circle train, every time you leave the train you will have to buy a new ticket, so the total cost depends on the amount of stops you make. Tickets can be bought at ticket boots at the train stations. What to take with on the circle train – Be sure to bring a fully charged camera, and some snacks and a bottle of water for the journey. Small snacks and drinks can be bought on the train platforms or on small stops near the train platforms as well. Be sure to arrive early to find a good seat on the train! Yangon is a busy and vibrant city and escaping this might seem hard. But you don’t have to look any further. Find your peace and quiet in the beautiful Kandawgyi Park. Take a stroll through the park or pay to walk over the boardwalk (2$) going over the lake, with stunning views. There are many restaurants in and around the park where you will be able to enjoy a cup of tea or a lunch. The park is a beautiful place for a sunset. Sadly when I visited it was pouring rain, and I had to keep my camera in my bag instead. Kandawgyi Park Location – Kandawgyi Park is not exactly located within walking distance of downtown Yangon, but is located 5km North. While it is walkable, it can get quite hot in Myanmar, so you might want to opt to take a taxi or Grab instead. Visiting the Shwedagon Pagoda? Now you are only a bit more then kilometer away from the park, so be sure to make a quick stop here as well! Kandawgyi Park Opening Hours – The park is open daily from 4am to 10pm. 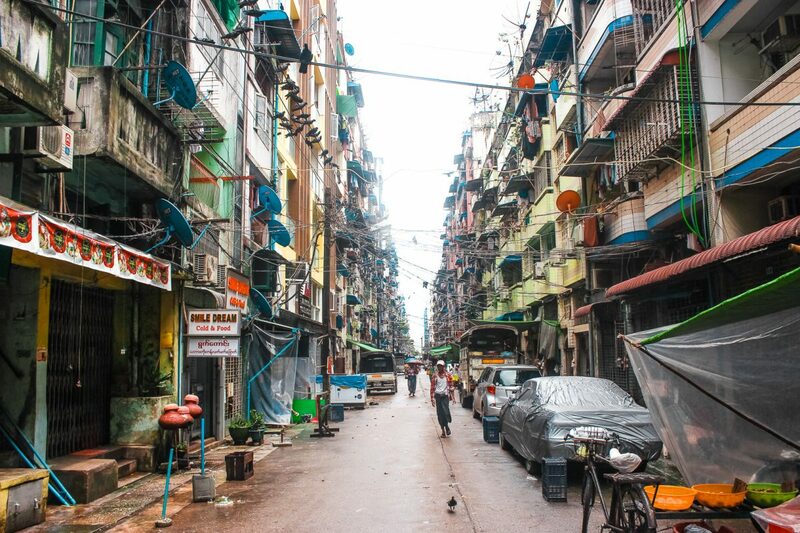 If you are visiting Yangon you will most likely find yourself staying in China Town. China Town is located in Downtown Yangon, and is filled with narrow streets, loads of restaurants and street vendors, many hostels and lots and lots of people. 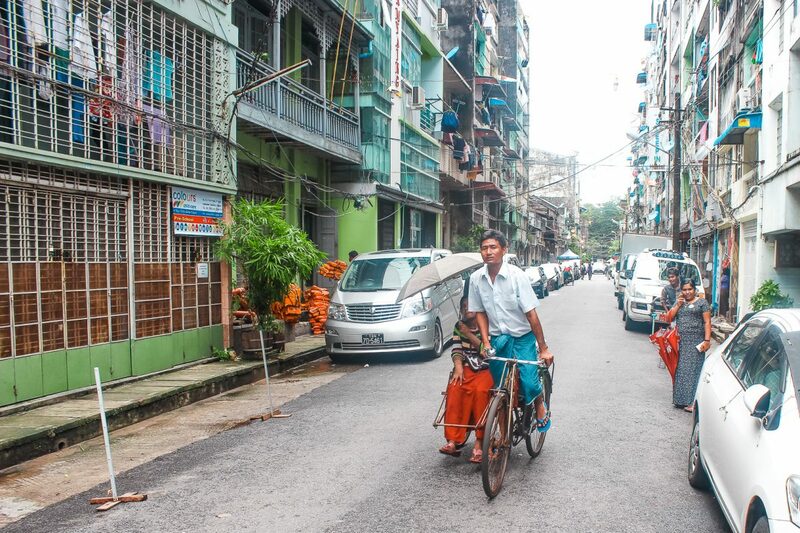 Downtown Yangon is a busy area to be, and walking through the streets is magical. 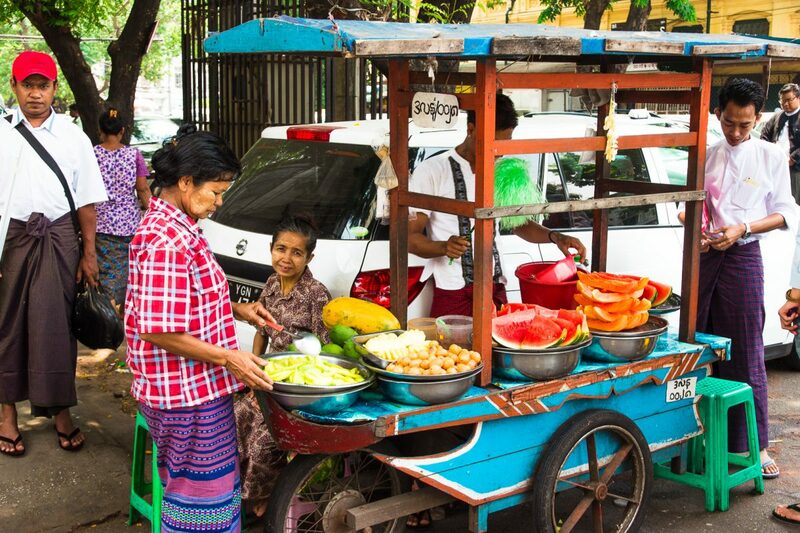 Experience local life in Yangon, eat snacks, go shopping, what can you not do in this area? Wandering around China Town is every food lover and street photography lovers dream, something that you cannot leave of your things to do in Yangon list! Where is Yangon’s China Town – China Town starts west of the Sule Pagoda and the centre of China Town is 19th street, but read more on that below. Best time to visit China Town – As it can get quite hot in Myanmar it is advised to wander around China Town earlier in the morning. See the local vendors sell fruits and veggies and visit the many stores. However, the heart of China Town, 19th street, comes to life when the sun has set. China Town’s 19th street turns into a bbq paradise in the evening. Pick up a basket, fill it with veggies on a stick, meat or fish on a stick and point where you will sit. They will grill it on the barbecue for you and bring it to your table, drink it with a local beer and your dinner is complete! Looking for a little party? The busy, but entertaining Ko San Bar sells mojito’s for 1$. Made with local rum and sold for such a small price you can’t blame them for always being filled up. 19th Street is the place to be in the evening for not only locals, but now also travelers and backpackers. Get a bear or mojito, find yourself a place to eat and just enjoy. Located on the 32nd street, you will find the Sule Pagoda in the middle of the busy roundabout. Take a walk around the pagoda and relax in the Maha Bandula Park situated right next to it. Around the Maha Bandula Park you will find many important buildings such as the Yangon City Hall and the High Court. 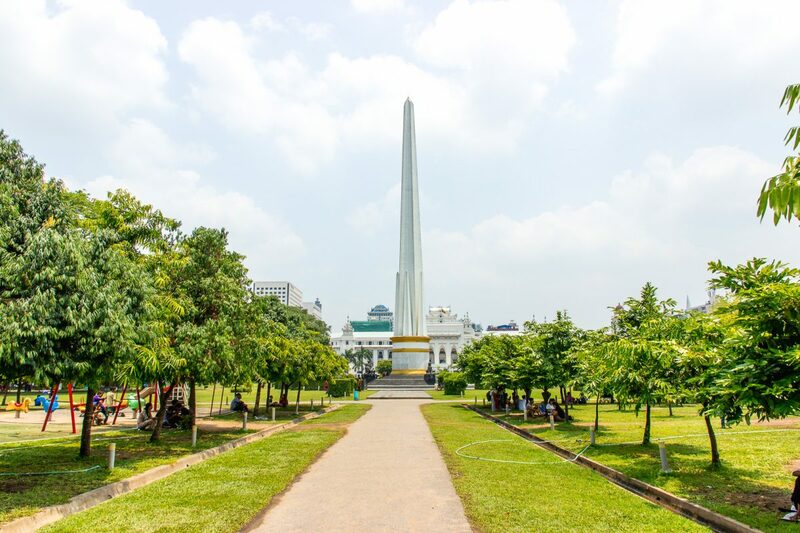 In the middle of the park you will find an obelisk, which is the independence monument placed in commemoration of British independence in 1948. The high court building is an iconic colonial era building, one of the many that you will pass when taking a walk through Old Yangon. Seeing the Sule Pagoda and Maha Bandula Park is a must see when visiting Yangon, so don’t forget to add it to your Yangon itinerary! 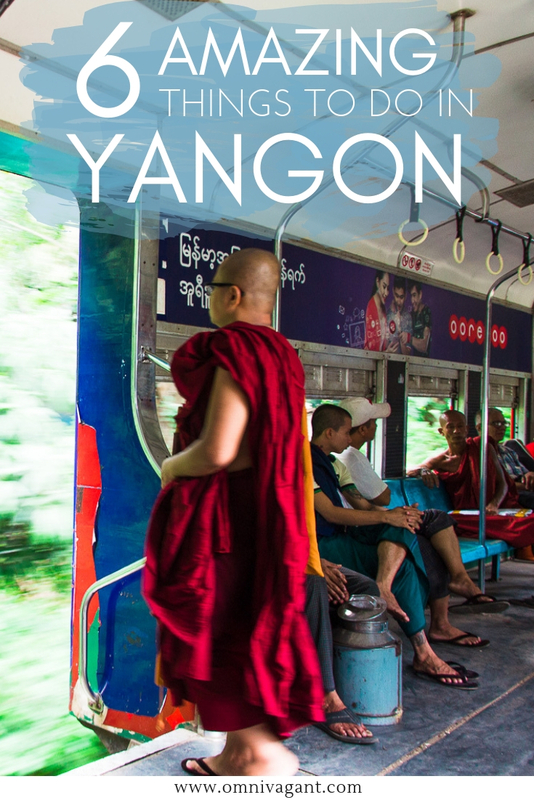 There you go, 6 things to do in the beautiful Yangon! Heading further into Myanmar? 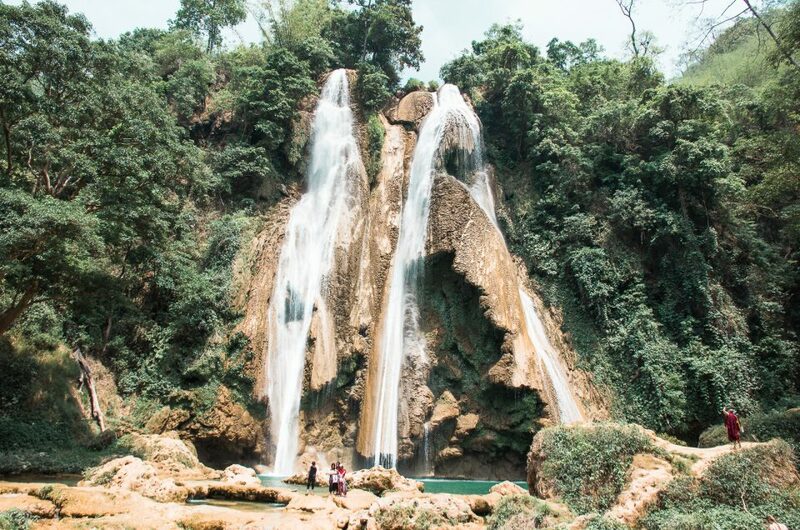 Don’t forget to check out our ultimate Myanmar Bucket List with over 60 things to do in Myanmar. Loving Myanmar’s cities? Be sure to check out our article on 9 Unforgettable things to do in Mandalay, one of Myanmar’s most beautiful cities. How about you, have you visited Yangon before? Tell us in the comments what your favorite things to do in Yangon is! Brings back wonderful memories! The beauty and serenity of Shwedagon Pagoda made us visit twice! Love your article, and your photographs are stunning! I always enjoy reading your writing. 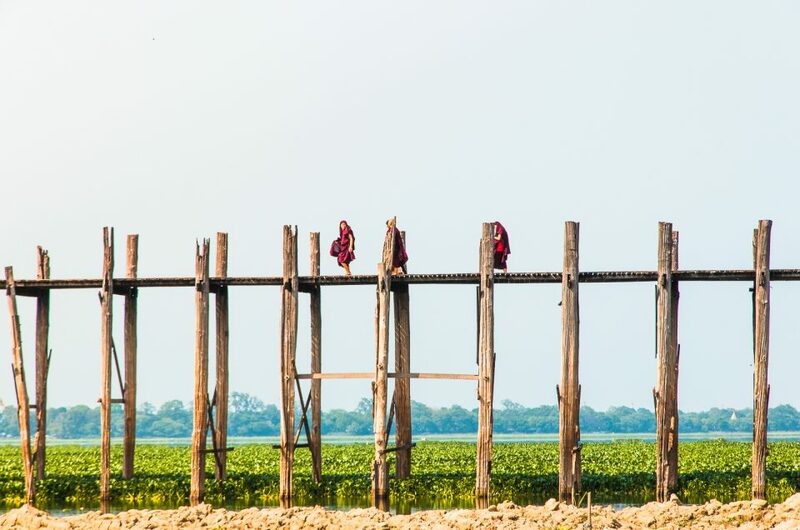 I have not been to Myanmar, but this certainly makes me to want get there quickly… when’s the next plane? Thanks Chantelle, that is so kind of you! I have been there twice now but am still longing to go back! Ahh that stupa looks unreal, it’s amazing! And I would so enjoy this train ride! Thanks Rosie! It is so stunning, truly amazing to witness! What a beautiful city! After reading your post I really want to visit Myanmar. 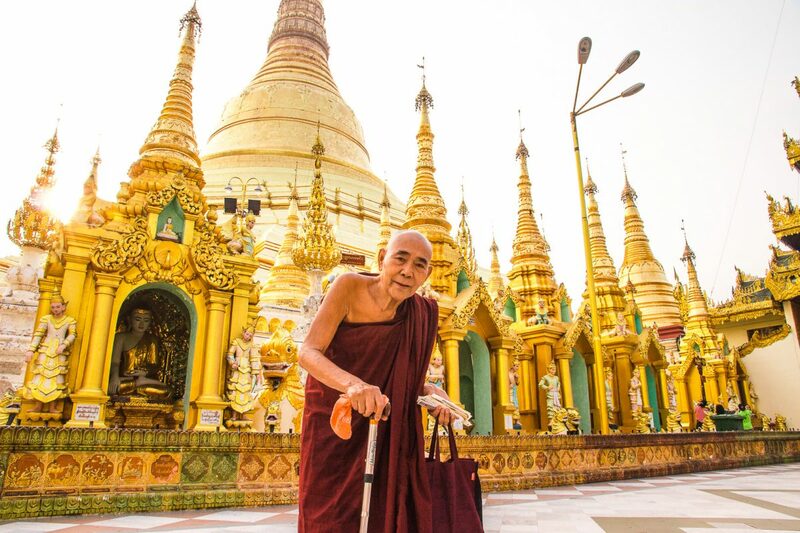 I love your photo of the monk at the Shwedagon Pagoda. Thanks Piia, I could not recommend visiting Myanmar more. It is so beautiful, people are so kind and there is so much to see and to do! I’d love to try that train and all the other things as well 🙂 Great post! It truly is! Can’t wait to go back!